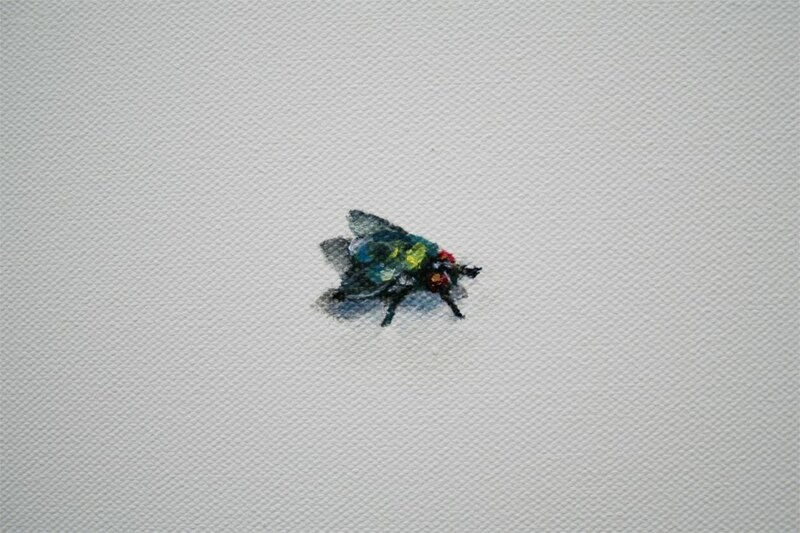 This work was exhibited at the “Bachelor Examensutställning 2012”. It is an installation consisting of a theatre stage, a one-page text for the audience to acquire and read, and an audio recording played on a hidden speaker. The audio recording consists of the text recited by an 88-year-old woman (my grandmother) in a sound studio. I chose my grandmother because I believe she adds authority to the work and a different aspect of time. The audio recording is played out loud in the gallery once every hour. The text and sound start by telling the audience about the emotions they might feel as they look at the stage. Later on, the spectator listens to the thoughts of a young woman entering the stage. Yet there is no woman. By means of the sound and the text, the audience follows her stream of thought while she struggles with herself being on stage. The text and sound end by shutting the spectator out of the woman’s mind. The spectator is left with the same kind of images as in the beginning, explaining the woman’s looks and movements. The artwork is presented as a performance. 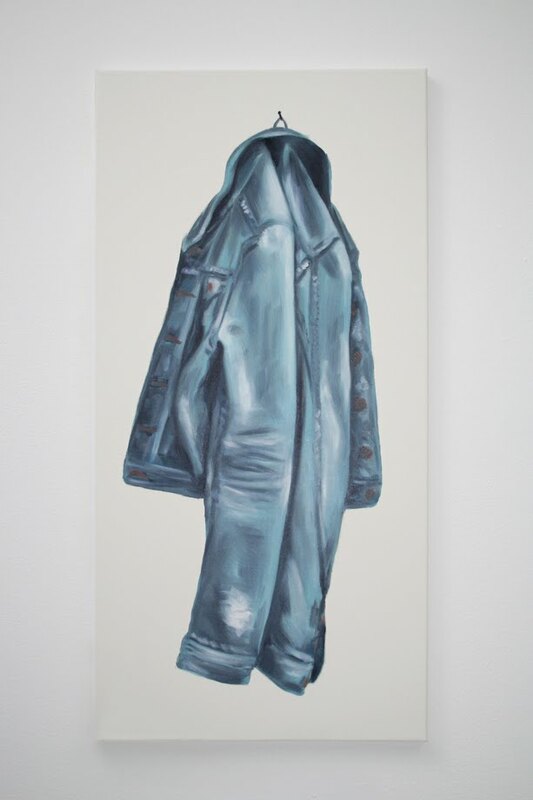 It deals with different existential and psychological aspects of the true and false self, narcissism and Joan Riviere’s feminist idea of womanliness as a masquerade. (Installation. Stage, text, audio recording, discman and speaker. 235 x 330 x 160 cm, 3:45 minutes). Photo documentation from the "Bachelor Examensutställning 2012". 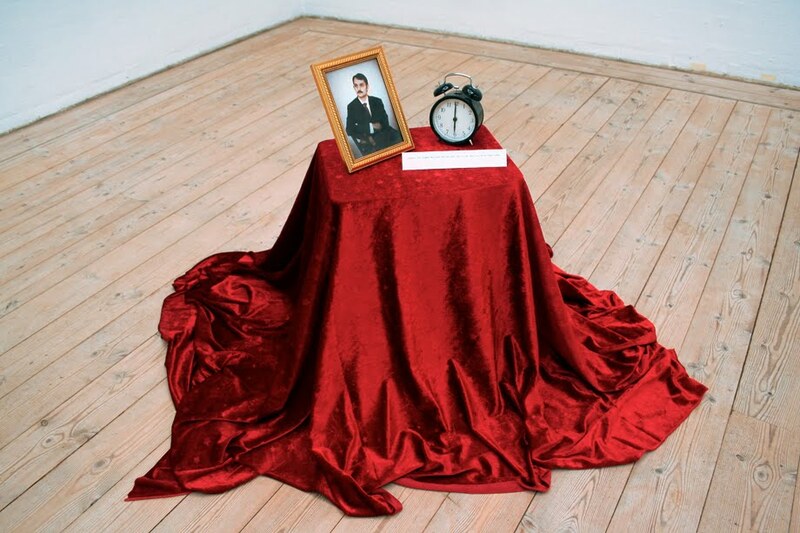 This work was exhibited at the “Malmö Art Academy Årsutställning 2012”. 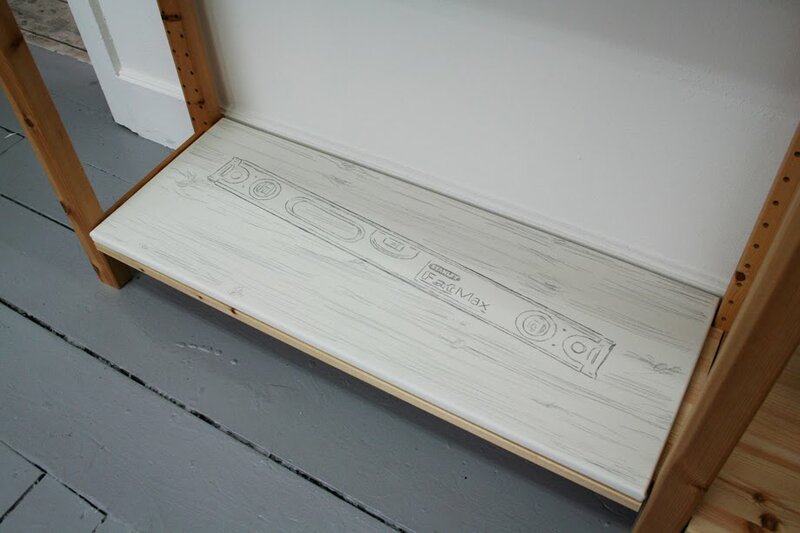 The installation consists of a flatscreen placed on top of a pedestal, which hides a DVD player that plays a DVD on loop. The DVD contains a video of my 88-year-old grandmother reciting a text I have written. I also used the text for my work "Curtain Call". I placed the flatscreen so the video fits my grandmother's height. (Installation. Flatscreen on pedestal, DVD player and DVD. 160 x 100 x 50 cm, 4:09 minutes). 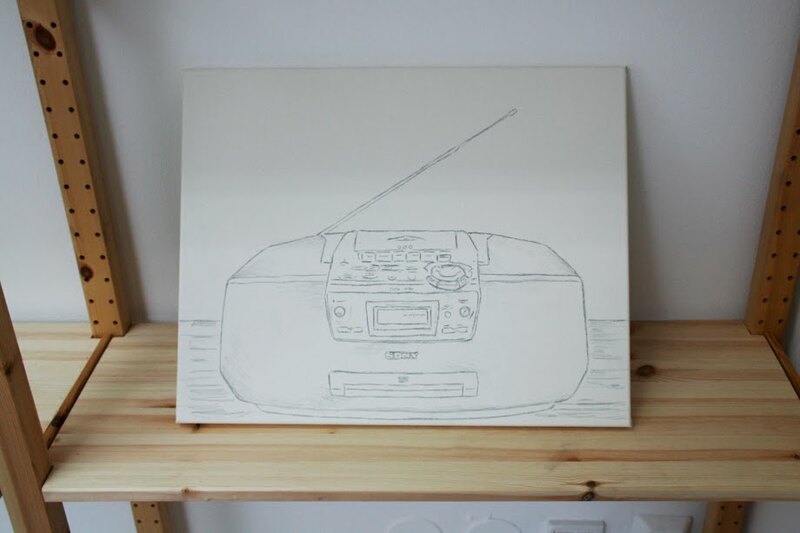 This artwork consists of a bound text and an audio recording. The text and audio tell the participant about the room he or she is standing in and about the other spectators at the exhibition. The text is handwritten with white pen on black paper and the layout refers to both movie subtitles and scrapbooks. The recording consists of the written text recited in a sound studio. The text is written in present tense, and it is my own voice that is heard on the recording. I speak directly to the listener and there is a deliberate distance between sound and text. At the end of the artwork, I ask the participant to remember my voice and to find me among the visitors at the exhibition. I want to convey a notion of presence and absence. Later on, I have come to think of how my voice sounds on the recording. I believe I have a clear pronunciation, which gives the recording the atmosphere of a storytelling. Thereby my voice refers to audio books. Photo documentation from the exhibition at the Inter Arts Center. 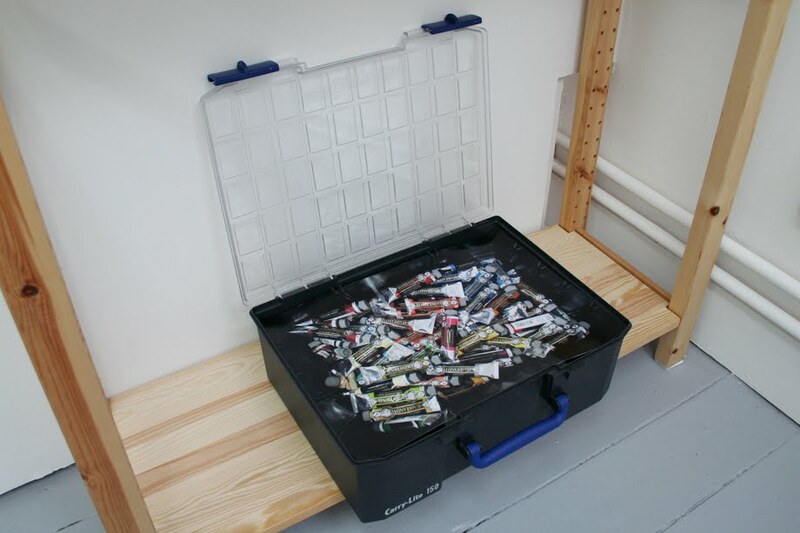 This installation consists of a stack of photocopies lying near the doorway in the project room at Malmö Art Academy. The work deals with themes such as obliteration of the self and the idea that nothing exists except through human consciousness. 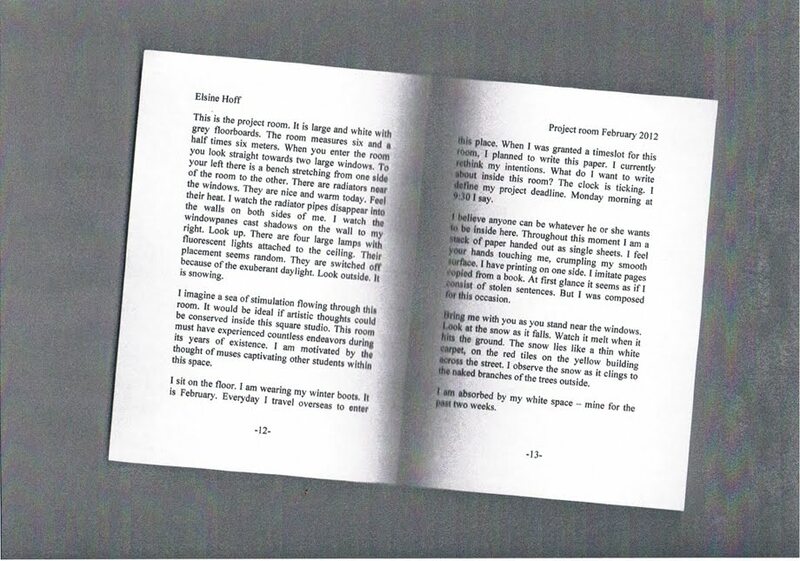 The text resembles a diary of my experiences of the project room. I wanted to use myself as subject matter while examining ideas about gallery and studio spaces. The text is written in present tense and tries to create a suspension of disbelief. I chose the photocopy layout for the work because I want to trick the spectator into believing that they are picking up a photocopy of an existing published book. Thereby there is a surprise element when the spectator is directly addressed in my text, which describes the room they are inside. I enjoy fiction as a means of expanding reality and this text is fictional for several reasons.Firstly, the site's appearance changes from when the text was written and until it is exhibited, but more importantly because the narrator is revealed to be the paper itself. This is an ongoing project currently consisting of 141 ten-trip-cards (train tickets) collected over a period of 11 years. Train tickets of this kind are used within 2 and 3 zones in the metropolitan area in Copenhagen. 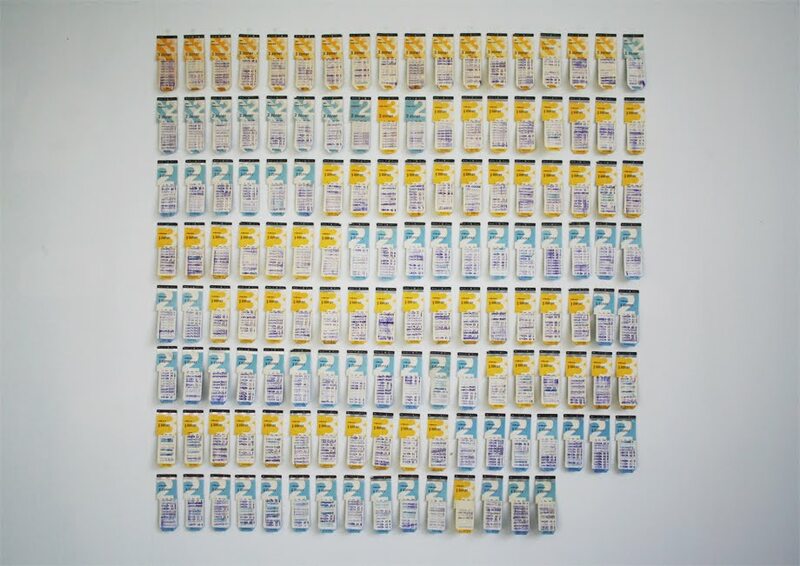 The artwork is personal and nostalgic because I have single-handedly used all the train tickets. There are many ways of arranging and rearranging the train tickets, for example by using another scale or shape, or creating different pictures or patterns etc. In this case it is a chronological archive of my traveling for the past 11 years. The individual stamps on the cards are traceable and therefore you can tell exactly where I have been. Furthermore this arrangement resembles my journey from childhood to adulthood. It is an observation of the self. The title of this work is taken from J.R.R. Tolkien’s “The Hobbit, or There and Back Again”, which I read when I used my first train ticket. I find that my abstract visual of real life traveling awakens feelings about make-believe. 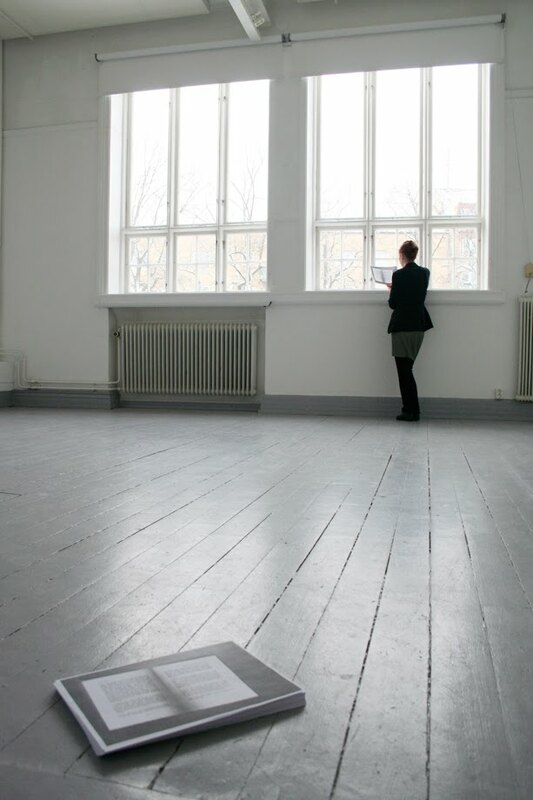 The installation was staged in a studio at Malmö Art Academy during the "Årsutställning 2010". Different kinds of art-studio interior are replaced or partially hidden by paintings and drawings, some of which gives one the feeling of looking through them. 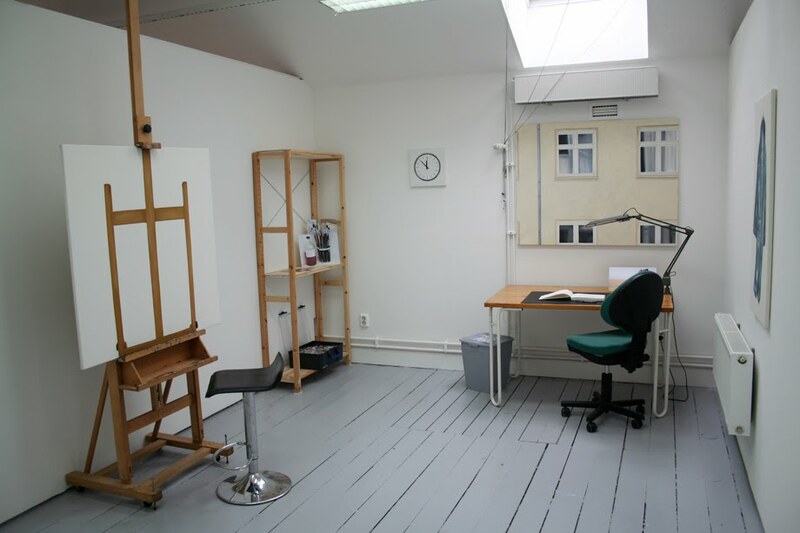 The studio gives the impression of a certain working routine such as listening to music while painting. 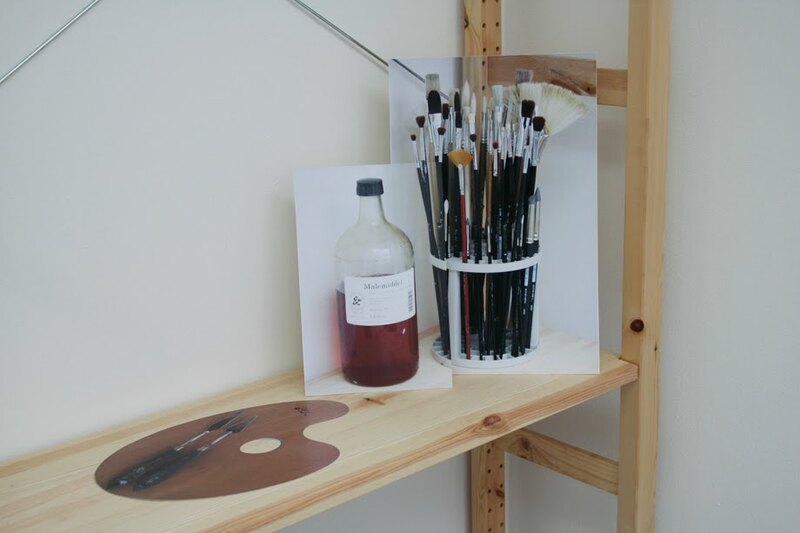 This creates a simple illusion of a functional yet mundane studio. Since the staged studio is placed inside my real studio, it resembles my way of working and decorating. Thereby the installation becomes a pseudo self-portrait. The canvases and photographs placed inside the studio resemble my current idea of illusions. Some of the pieces only works as an illusion through a chosen perspective. For that reason, they might be the most effectual illusions in this artwork. Photo documentation from the "Årsutställning 2010". This work was exhibited at the "Årsutställning 2012". 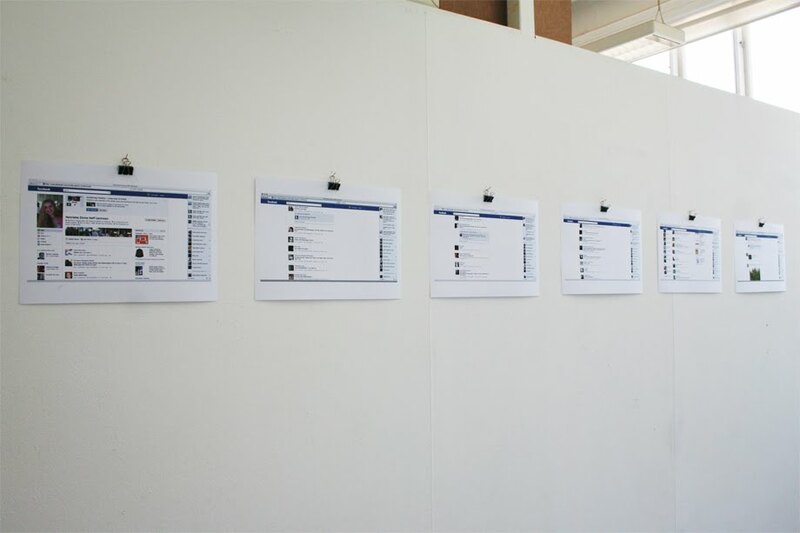 It consists of six pages of Facebook-wall conversations from my personal profile. I want to emphasize and visualize the implications about identity search and personal exposure which the social media explosion has brought along. The installation above was exhibited at the group exhibition “Årsutställning 2011” at Malmö Art Academy. It is inspired by the content of “Peter and Wendy”, in which Wendy is shot by a group of young boys called “The Lost Boys”. The Lost Boys and Peter Pan decide to build a small house around the wounded Wendy. When the boys finish the construction, they ask Wendy if she would like to be their mother. She agrees, and is then moved to their underground home for safekeeping. 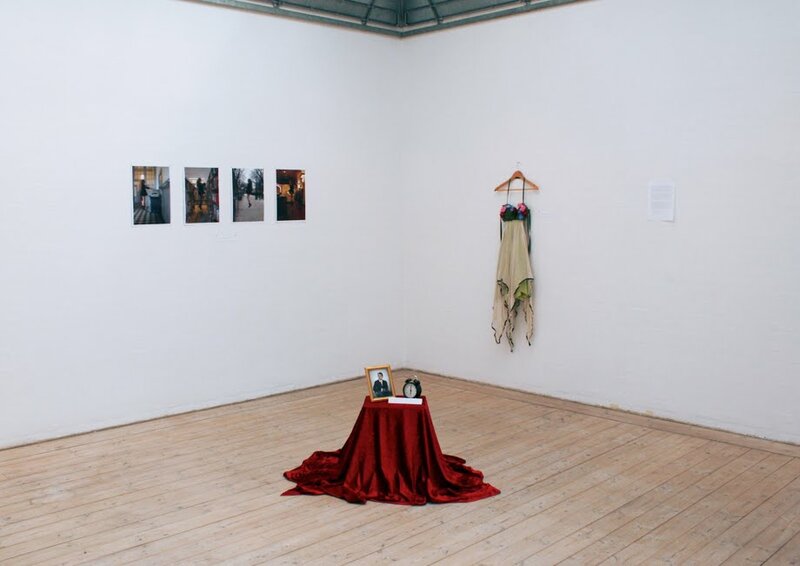 My installation reflects on women’s roles in the Edwardian era (1901-1910), which had strict class division and very traditional roles for men and women, when the stories of Peter Pan were written. The two psychology books “The Peter Pan Syndrome” (1983) and “The Wendy Dilemma” (1984) by Dr. Dan Kiley also inspired the work. Barrie invented the girl’s name Wendy, which was used for the first time in his stories. 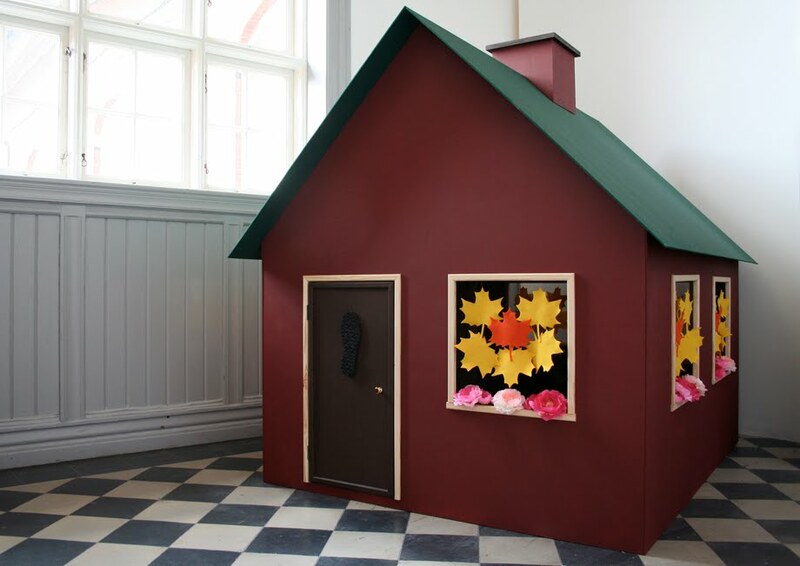 Later on, the term “Wendyhouse” became a synonym for small children’s playhouses. The exterior of my installation is based upon the instructions in Barrie's “Peter and Wendy” and my construction attempts to be an extract from the fairytale. Thereby I try to expand reality by forcing fiction upon it. 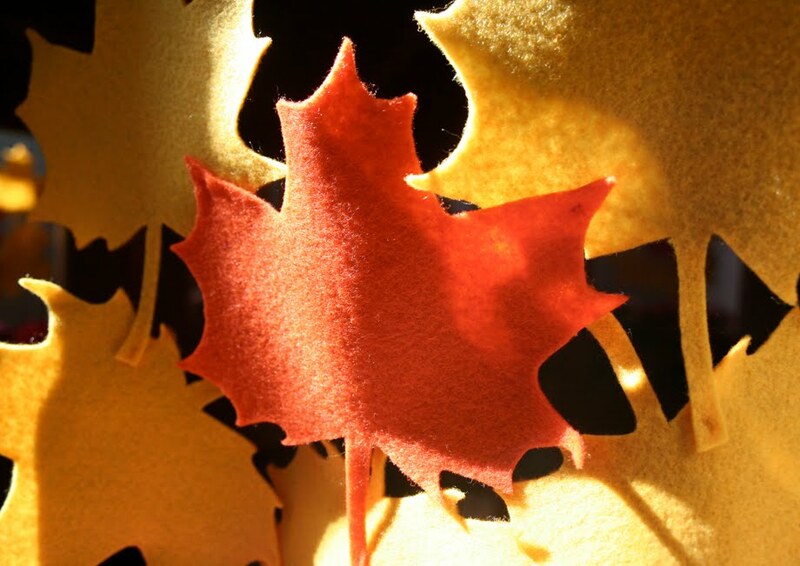 Close up of the maple leaf curtains. 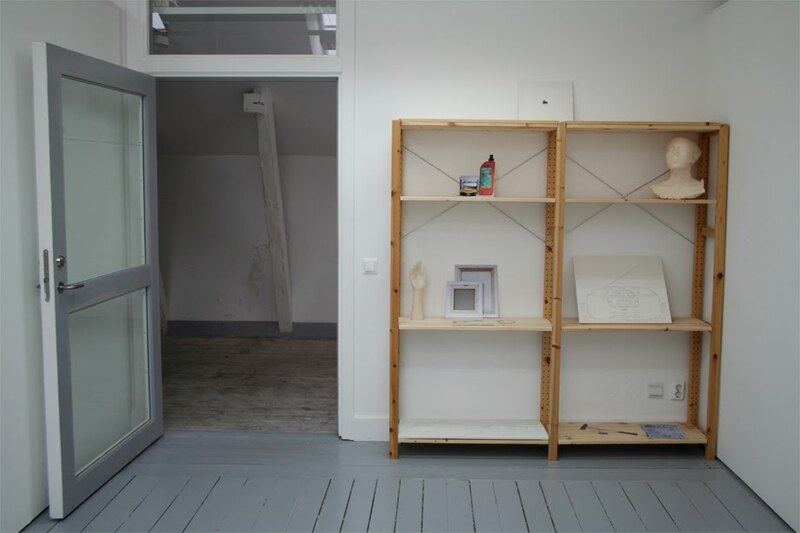 The image above is an installation view of my works at the group exhibition “DCK#2011” at Filosofgangen, Odense. The image includes “This girl is gay and innocent and heartless” (see photography), “Author Sir James Matthew Barrie and the clock the crocodile swallowed” and “Costume worn by Miss Jane Wren at the Duke of York’s Theatre”. The objects from the installation refer to Barrie and his famous tale of Peter Pan. The framed portrait is a photograph I have taken, and it represents my personal visualization of Sir Barrie. The clock is supposedly brought to the real world from the imaginary Neverland. It is an extract from the fairytale. 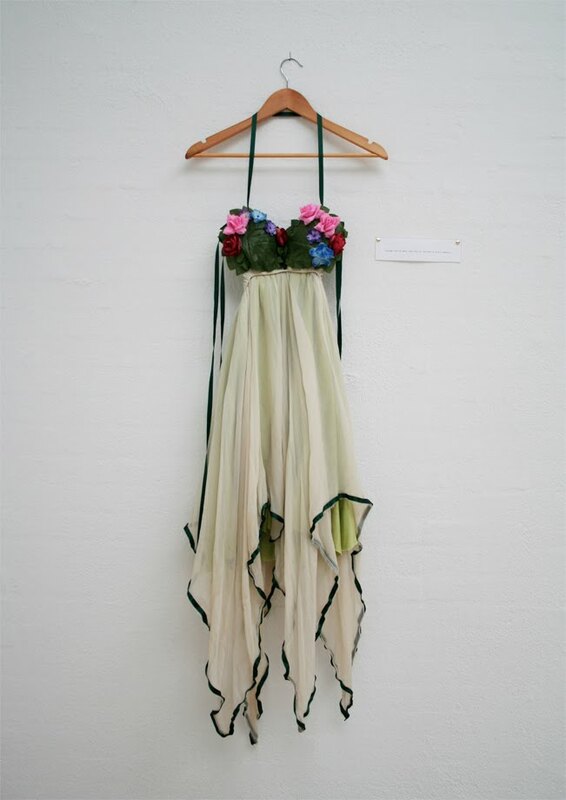 The installation consists of a dress and refers to the initial setup of Barrie’s play about Peter Pan. At that time, a flickering light and the sound of bells represented the fairy Tinker Bell on stage. A “Miss Jane Wren” was listed in the program as the actress who played Tinker Bell to highlight the magic of the play.